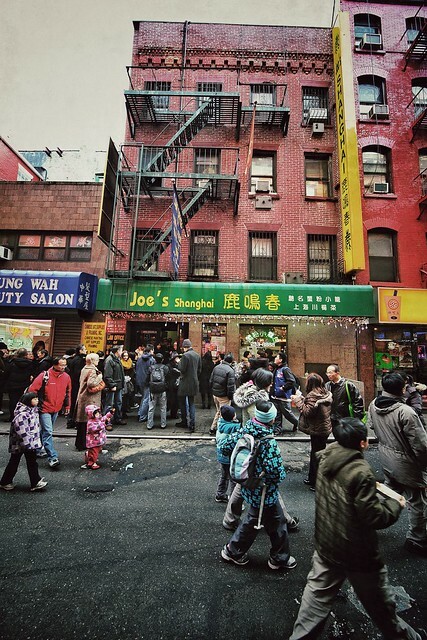 One of my best NYC eating memories was here, at Joe's Shanghai, home of where many people consider the best place to find Chinese "soupy" dumplings. We over-ordered, getting 2 trays of the crab variety and 2 of the pork-only variety. We both prefer the pork-only variety; for 2 people who have this treat like every 2 years, I recommend 3 trays, one with crab, and 2 with pork. We had to wait an hour to get in; we had lunch at 3 PM. I love the color and amped it a bit with Snapseed. The restaurant is located on Pell Street.